As early as the fourteenth century Bohemia had welcomed such musicians as Machaut at the court of King John. By the sixteenth century a large number of songbooks were published whose popularity spread into the Bohemian border lands of Germany and Hungary, and Prague became the imperial residence of Emperor Rudolf II. The city became an important centre for the outstanding musicians of the day and began to coordinate its musical life with Vienna and the German capitals. By the turn of the eighteenth century a major contribution to Austro-German musical literature had been made by Bohemian composers. This national orientation found in the nineteenth century two worthy champions—composers whose works form a fitting climax to the establishment of Bohemian national music—Bedřich Smetana and Antonín Dvořák. The former became known as ‘the father of Czech music’ and he drew on the great treasury of Bohemian folksong and dance as a radiant source of inspiration. His compatriot, Dvořák, was much attracted by the noble ideals of Brahms yet sought to maintain the spirit of national consciousness in his work. It is here that the Bohemian national school can be seen to advantage when compared with other national schools, for example the Russian and Scandinavian, that arose at the same time. The Czech musicians effect a natural spontaneity in their idiom which surpasses their contemporaries. It is this particular aspect which illuminates Dvořák’s art, and which endears his music to so wide an audience. Born within a few miles of Prague, in September 1841, Antonín was the eldest of eight children. He showed no musical precocity and at the age of twelve became apprentice to his father in the butchers’ trade. The family enjoyed little prosperity, however, and when the young man’s musical talents revealed themselves it was Antonín’s uncle who provided the wherewithal for him to enter the Prague Organ School at the age of sixteen. This further education was sufficient to allow Antonín to gain a foothold in the musical profession as a viola player in a band. The band performed some three times a week in inns and restaurants, an experience that must have been important to the emerging composer, providing as it did close contact with the public. He was soon to experience a real highlight in his early career when he took part in a concert of Wagner’s music conducted by the great man himself. This was not altogether an unalloyed blessing since the inexperienced young Bohemian found Wagner’s music altogether too powerful an influence on his own writing. Only after timely warnings from Smetana was the struggling composer persuaded to abandon the direction his work was taking. Dvořák now began to write music of true significance and his interest in chamber music became obvious. Written in a two-week period in May 1878, the String Sextet was composed soon after the enormously successful Slavonic Dances and, in the summer of the following year, it was performed at the Berlin home of Joachim at a soirée in honour of the Czech composer. The reception accorded Dvořák’s music by a distinguished audience was an experience he was long to remember. Full of spontaneous invention in the manner of Schubert, the Sextet’s themes have been described as ‘flowing with Slavonic blood’. They are delightfully deployed in the course of the first movement and well contrasted, the second subject being in the mediant. There is but a short development section before the recapitulation which is in F sharp instead of the tonic key. To describe the second movement Dvořák uses the Russian term ‘Dumka’, an indication of the employment of strongly contrasted sections, sometimes very sad and sometimes happy. Over a steady march-like rhythm Dvořák’s asymmetrical phrase structure assists in making this one of the composer’s most interestingly novel movements, incorporating slow gypsy music and a tender lullaby. A return to the rhapsodizing gypsies is made in the coda. Although called ‘Furiant’, the following movement has none of the characteristic cross-rhythmic effects associated with this type of music. It is a vigorous scherzo which includes in its trio section an allusion to the first Slavonic Dance. The last movement consists of five variations and stretta on a B minor theme which in truth seem not to have the spontaneity of the accompanying movements. The conclusion of the work is rather too boisterous and perhaps prolongs its leave-taking to its disadvantage. In September 1892 Dvořák, together with his wife and their eldest son and daughter, arrived in New York to take over the directorship of the National Conservatory of Music in that city. It was a somewhat strange institution in that although it provided excellent teaching it awarded no diplomas, and coloured folk were provided with free tuition whilst others paid only what they could afford. This benevolent policy stemmed from the President of the National Conservatory, the worthy and redoubtable Mrs Jeannette Thurber. It was a policy with which the kindly Dvořák was in complete sympathy. During his stay in America the Czech composer missed his homeland keenly and was delighted to be invited for a summer vacation to Spillville, a little Czech settlement in Iowa. The settlement, miles from anywhere, became a ‘home from home’ for Dvořák who even played the organ for the settlers at services in their little church. An added delight for the composer was the presence of the rest of his family who joined him for the summer. In this joyful atmosphere were written many of Dvořák’s loveliest works including the famous ‘American’ Quartet, Op 96, and the String Quintet, Op 97, here recorded, which at one time also rejoiced in the soubriquet ‘American’. The Quintet was written between 26 June and 1 August 1893 and first performed at New York’s Carnegie Hall on 24 January of the following year. During Dvořák’s stay in Spillville the settlement was visited by a group of North American Indians of the Kickapoo tribe, led by Big Moon and his wife, Large Head. They came to sell medicinal herbs and stayed for several days performing their songs and dances to the delight of Dvořák and his hosts. Exactly how much this experience influenced the composition of the Quintet is conjectural, and could easily be overstated; however, there is little doubt that the composer was fascinated by what he heard and that it had at least some effect on the music he was writing at the time. The Quintet opens with a solo melody for the extra player, the second viola, but it is another subject which forms the main material for the development section, a melody based on an Indian song Dvořák heard at Spillville. A strangely sad episode featuring the two violas is heard before the shortened recapitulation. The succeeding scherzo is quite excellent and uses a theme in the trio section reminiscent of one heard in the slow movement of the ‘New World’ Symphony. It is also of similar character to the viola theme which forms the basis for the variations in the Sextet. The third movement, a Larghetto theme and five variations, leaves the exotic atmosphere of Indian music for that of simple devotion. The subject of the variations is half in the major and half in the minor, ingeniously composed. The music returns in the end to the unadorned theme. Whilst the presence of Beethoven may be felt in the variation movement, the Finale’s main theme is noticeably similar to one of Schubert’s in the Finale of the latter’s Trio in E flat, D929, and indeed to a theme of Smetana’s in his G minor Trio. Though interesting to observe, such references to the works of others do nothing to detract from Dvořák’s achievements in this Quintet. His own individual qualities are fully able to withstand any criticism that might be engendered in this connection by those unable to appreciate the true genius of this genial man. Dès le XIVe siècle, des musiciens comme Machaut furent reçus en Bohême, à la cour du roi Jean. Au XVIe siècle, un grand nombre de chansonniers furent publiés, dont la popularité gagna les terres bohémiennes limitrophes de l’Allemagne et de la Hongrie. Prague, choisie comme résidence impériale par l’empereur Rudolf II, devint un important centre pour les grands musiciens de l’époque et se mit à coordonner sa vie musicale avec celle de Vienne et des capitales allemandes. Au tournant du XVIIIe siècle, les compositeurs bohémiens avaient apporté une contribution majeure à la littérature musicale austro-allemande. Cette orientation nationaliste trouva, au XIXe siècle, deux défenseurs émérites, deux compositeurs dont les œuvres font une belle apothéose à l’avènement de la musique bohémienne: Bedřich Smetana et Antonín Dvořák. Smetana, qu’on appellera «le père de la musique tchèque», prit pour rayonnante source d’inspiration le formidable trésor des chansons traditionnelles et des danses bohémiennes. Son compatriote Dvořák fut, lui, davantage attiré par les nobles idéaux brahmsiens, tout en cherchant à préserver l’esprit de la conscience nationale. C’est en cela que l’école nationale bohémienne l’emporte sur les autres écoles nationales apparues à la même époque (en Russie ou en Scandinavie, par exemple), les musiciens tchèques insufflant à leur idiome plus de spontanéité naturelle que leurs contemporains. C’est d’ailleurs elle qui illumine l’art de Dvořák et vaut à sa musique d’être aimée d’un large public. Né à quelques kilomètres de Prague, en septembre 1841, Antonín était l’aîné de huit enfants. Il ne montra aucune précocité musicale et devint, à douze ans, apprenti dans la boucherie paternelle. La famille connaissait cependant une petite prospérité et, quand ses talents musicaux se révélèrent, ce fut son oncle qui finança son entrée, à seize ans, à l’école d’orgue de Prague. Cette formation supplémentaire permit à Antonín de prendre pied dans la profession musicale, comme altiste dans un orchestre se produisant trois fois par semaine dans des auberges et des restaurants—une expérience qui, par le contact étroit qu’elle lui offrit avec le public, dut être importante pour ce compositeur en devenir. Bientôt, il connaîtra un véritable temps fort dans sa carrière naissante en participant à un concert d’œuvres de Wagner dirigé par le grand homme en personne. Ce qui ne fut pas vraiment une bénédiction car la musique wagnérienne influença par trop puissamment l’écriture du jeune Bohémien inexpérimenté et les mises en garde de Smetana arrivèrent juste à temps pour persuader notre compositeur en peine d’abandonner cette orientation artistique. Dès lors, il se mit à écrire une musique d’importance et son intérêt pour la musique de chambre devint manifeste. Rédigé en deux semaines au mois de mai 1878, soit peu après l’énorme succès des Danses slaves, le Sextuor à cordes fut joué à Berlin, durant l’été de 1879, lors d’une soirée donnée chez Joachim en l’honneur de Dvořák, qui n’oublia pas de sitôt l’accueil que cet auditoire éminent réserva à sa musique. Gorgés d’une invention spontanée toute schubertienne, les thèmes du Sextuor ont, a-t-on pu dire, «du sang slave dans les veines». Ils sont merveilleusement déployés dans le premier mouvement et bien contrastés, le second sujet étant à la médiante. Seul un court développement précède la réexposition, laquelle est non pas à la tonique mais en fa dièse. Pour qualifier le deuxième mouvement, Dvořák utilise le terme russe «Dumka», signe de sections très contrastées, tantôt fort tristes, tantôt heureuses. Par-desus un rythme de marche régulier, la structure de phrase asymétrique concourt à faire de ce nouveau mouvement l’un des plus intéressants de Dvořák, intégrant une musique tzigane lente et une tendre berceuse. La coda voit le retour des tziganeries façon rhapsodie. Bien que baptisé «Furiant», le mouvement suivant ne présente aucun des effets de contre-rythme associés à ce genre de musique. C’est un vigoureux scherzo, dont la section en trio fait allusion à la première Danse slave. Le dernier mouvement comprend cinq variations et une strette sur un thème en si mineur qui, à dire vrai, ne semble pas avoir la spontanéité des mouvements accompagnants. La conclusion, un peu trop turbulente, prolonge peut-être à tort la survenue de l’adieu. En septembre 1892, Dvořák, accompagné de sa femme, de son fils aîné et de sa fille, débarqua à New York, où l’attendait la direction du National Conservatory of Music. C’était un établissement singulier, qui délivrait un enseignement excellent mais aucun diplôme. De surcroît, les cours étaient gratuits pour les gens de couleur, les autres payant seulement ce qu’ils pouvaient—une politique bienveillante qui émanait de la présidente, la louable et redoutable Mme Jeannette Thurber, et à laquelle l’affable Dvořák adhérait totalement. Pendant son séjour en Amérique, le compositeur tchèque se languit vivement de sa patrie et ce fut avec joie qu’il se rendit à Spillville, une petite communauté tchèque de l’Iowa où il avait été invité pour les vacances d’été. Ce village, à des lieues de tout, devint un «second chez-soi» pour Dvořák, qui tint même l’orgue dans la petite église. Pour comble de bonheur, sa famille le rejoignit pour l’été. 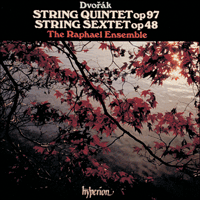 Ce fut dans cette atmosphère joyeuse que naquirent nombre de ses œuvres les plus ravissantes, dont le célèbre Quatuor «Américain» op.96 et le présent Quintette à cordes op.97 qui fut aussi, un temps, surnommé l’«Américain». Écrit entre le 26 juin et le 1er août 1893, il fut créé au Carnegie Hall de New York le 24 janvier 1894. Pendant le séjour de Dvořák, des Indiens nord-américains de la tribu des Kickapoos, dirigée par Big Moon et sa femme Large Head, vinrent vendre des herbes médicinales à Spillville et passèrent plusieurs jours à interpréter leurs chants et leurs danses à la grande joie de Dvořák et de ses hôtes. On peut seulement conjecturer, et aisément surestimer, l’influence que cette expérience eut réellement sur la composition du Quintette; mais il ne fait guère de doute que Dvořák fut fasciné par ce qu’il entendit, et que sa musique s’en ressentit. Le Quintette s’ouvre sur une mélodie solo pour l’interprète supplémentaire, le second alto, mais c’est un autre sujet qui constitue le matériau principal du développement: une mélodie fondée sur un chant amérindien entendu à Spillville. Un épisode étrangement triste mettant en scène les deux altos précède la réexposition abrégée. La section en trio du scherzo suivant, absolument excellent, utilise un thème rappelant celui du mouvement lent de la Symphonie «du Nouveau Monde». Son caractère est en outre similaire à celui du thème d’alto fondateur des variations du Sextuor. Le troisième mouvement, un thème Larghetto et cinq variations, délaisse l’exotisme de la musique amérindienne pour une atmosphère de simple dévotion. Le sujet des variations est moitié en majeur, moitié en mineur et ingénieusement composé. À la fin, la musique retrouve le thème dépouillé. La présence de Beethoven est perceptible dans le mouvement de variations, tandis que le thème principal du Finale s’approche remarquablement de celui du Finale du Trio en mi bémol D929 de Schubert et, au vrai, d’un thème du Trio en sol mineur de Smetana. Pour intéressantes qu’elles soient, ces références n’ôtent rien à ce que Dvořák a accompli dans ce Quintette: ses qualités propres sont parfaitement à même de résister aux critiques que ces connexions pourraient susciter chez des gens incapables d’apprécier l’authentique génie de cet homme affable. Schon im 14. Jahrhundert wurden in Böhmen Musiker wie zum Beispiel Machaut am Hof von König Johann willkommen geheißen. Im 16. Jahrhundert lag bereits eine beträchtliche Anzahl veröffentlichter Gesangsbücher vor, deren Popularität sich bis in die deutschen und ungarischen Nachbarländer ausdehnte; Prag wurde dann zur kaiserlichen Residenzstadt Rudolfs II.. Die Stadt wurde für herausragende Musiker der Zeit ein wichtiges Zentrum, das sein Musikleben zunehmend mit Wien und den deutschen Hauptstädten koordinierte. Bis zum Beginn des 18. Jahrhunderts hatten die böhmischen Komponisten wesentlich zur deutsch-österreichischen Musikliteratur beigetragen. Diese nationale Orientierung wurde im 19. Jahrhundert von zwei würdigen Verfechtern—Komponisten, deren Werke den Höhepunkt der böhmischen Nationalmusik darstellen—aufgenommen: Bedřich Smetana und Antonín Dvořák. Ersterer wurde als „Vater der tschechischen Musik“ bekannt und griff auf den großen böhmischen Tanz- und Volksliedschatz zurück, der sich als eine strahlende Inspirationsquelle erweisen sollte. Sein Landsmann Dvořák fühlte sich besonders zu den erhabenen Brahmsschen Idealen hingezogen, bemühte sich jedoch auch darum, den Geist des Nationalbewusstseins in seinem Werk zu bewahren. Im Vergleich zu anderen nationalen Schulen, wie etwa der russischen oder skandinavischen Schule, die sich zur selben Zeit entwickelten, wirkt dieser Aspekt der böhmischen Nationalschule zu ihrem Vorteil. Den tschechischen Musikern gelingt in ihrer musikalischen Sprache eine natürliche Spontaneität, die diejenige ihrer Zeitgenossen übertrifft. Es ist eben dieses Element, das Dvořáks Kunst erhellt und durch das seine Musik bei einem so großen Publikum derart beliebt ist. Antonín Dvořák wurde im September 1841 als ältestes von acht Kindern in der Nähe von Prag geboren. Er zeigte keine musikalische Frühbegabung und wurde im Alter von 12 Jahren von seinem Vater als Metzgerlehrling angestellt. Die Familie war recht arm, und als sich das musikalische Talent des jungen Mannes bemerkbar machte, war es sein Onkel, der es ihm ermöglichte, ab dem Alter von 16 Jahren die Prager Orgelschule zu besuchen. Diese zusätzliche musikalische Ausbildung war ausreichend, dass Antonín in der Musikwelt Fuß fassen und sich als Bratscher in einer Kapelle betätigen konnte. Diese Kapelle trat etwa dreimal pro Woche in Wirtshäusern und Gaststätten auf, was für den angehenden Komponisten eine wichtige Erfahrung gewesen sein muss, da er auf diese Weise mit dem Publikum in enge Berührung kam. Es sollte ihm bald ein besonderer Höhepunkt seiner frühen Karriere beschert werden, als er bei einem Konzert mit Werken Wagners mitwirkte, das von dem großen Mann selbst dirigiert wurde. Es war dies allerdings kein reiner Segen, da der noch unerfahrene junge Böhme den Einfluss, den die Musik Wagners auf seine eigenen Werke ausübte, als zu gewaltig empfand. Smetana warnte den sich mühenden Komponisten noch rechtzeitig und überzeugte ihn davon, eine andere Richtung einzuschlagen. Dvořák begann daraufhin, Musik von wahrer Bedeutung zu schreiben und sein Interesse an Kammermusik prägte sich deutlich aus. Schon bald nach den äußerst erfolgreichen Slawischen Tänzen entstand innerhalb von zwei Wochen im Mai 1878 das Streichsextett, das im Sommer des folgenden Jahres in der Berliner Villa Joseph Joachims bei einer Soiree zu Ehren des tschechischen Komponisten uraufgeführt wurde. Die Reaktion des distinguierten Publikums auf die Musik Dvořáks sollte dem Komponisten noch lange in Erinnerung bleiben. Die Themen des Sextetts sind voller spontaner Einfälle in der Art Schuberts, in denen—wie es in einer Beschreibung heißt—„slawisches Blut pulsiert“. Sie werden im Laufe des ersten Satzes sehr reizvoll eingesetzt und gelungen einander gegenübergestellt, wobei das zweite Thema in der Mediante steht. Die Durchführung ist kurz gehalten, bevor die Reprise in Fis anstelle der Tonika erklingt. Dvořák bedient sich des russischen Terminus „Dumka“, um den zweiten Satz zu beschreiben—ein Hinweis auf ausgesprochen gegensätzliche Abschnitte, zuweilen sehr traurig und dann wieder sehr fröhlich. Über einem beständigen marschähnlichen Rhythmus wird Dvořáks asymmetrische Phrasenstruktur zu einem besonders interessanten und neuartigen Satz, in dem unter anderem langsame Zigeunermusik und ein sanftes Wiegenlied erklingen. In der Coda erfolgt eine Rückkehr zu den rhapsodischen Zigeunern. Obwohl der folgende Satz mit „Furiant“ bezeichnet ist, besitzt er keinerlei polyrhythmische Charakteristika, die sonst mit dieser Art von Musik in Verbindung gebracht werden. Stattdessen handelt es sich hierbei um ein lebhaftes Scherzo, in dessen Trio eine Anspielung an den ersten Slawischen Tanz zu hören ist. Der letzte Satz besteht aus fünf Variationen und einer Stretta über ein Thema in h-Moll, die jedoch nicht die Spontaneität der anderen Sätze zu besitzen scheinen. Der Abschluss des Werks ist etwas zu ungestüm geraten und dehnt das Abschiednehmen vielleicht zu seinen Ungunsten aus. Im September 1892 reiste Dvořák zusammen mit seiner Frau und den ältesten beiden Kindern nach New York, um dort den Direktorenposten am National Conservatory of Music zu übernehmen. Es war dies eine etwas eigenartige Institution—zwar war der Unterricht hervorragend, doch wurden keine Abschlusszeugnisse ausgestellt. Zudem waren Schwarze von Studiengebühren befreit, während andere so viel zahlten, wie sie es sich leisten konnten. Dieses wohltätige Konzept stammte von der Präsidentin des National Conservatory, der würdigen und gefürchteten Mrs Jeannette Thurber, und kam dem großzügig gesinnten Dvořák ausgesprochen entgegen. Während seines Aufenthalts in Amerika vermisste der tschechische Komponist sein Heimatland sehr und freute sich über eine Einladung zu einem Sommerurlaub in Spillville, einer kleinen tschechischen Kolonie in Iowa. Diese abgelegene Siedlung wurde für Dvořák eine zweite Heimat, wo er sogar in den Gottesdiensten in der kleinen Kirche das Orgelspiel übernahm. Ein weiterer glücklicher Umstand für den Komponisten war, dass der Rest seiner Familie ebenfalls den Sommer über dort war. In dieser fröhlichen Atmosphäre entstanden mehrere besonders schöne Werke Dvořáks, wie zum Beispiel das berühmte „Amerikanische Streichquartett“ op. 96 und das hier vorliegende Streichquintett op. 97, das ebenfalls einst den Beinamen „Amerikanisch“ trug. Das Quintett entstand zwischen dem 26. Juni und 1. August 1893 und wurde erstmals am 24. Januar 1894 in der New Yorker Carnegie Hall aufgeführt. Während Dvořáks Aufenthalt in Spillville wurde die Siedlung von einer Gruppe nordamerikanischer Indianer des Kickapoo-Stamms aufgesucht, die von Big Moon und seiner Frau, Large Head, angeführt wurden. Sie verkauften Heilkräuter und blieben mehrere Tage und führten zur Freude Dvořáks und seiner Gastgeber ihre Lieder und Tänze auf. Inwiefern diese Erfahrung die Komposition dieses Quintetts genau beeinflusste, lässt sich nicht feststellen und kann nur allzu leicht überbewertet werden; zweifellos war der Komponist jedoch fasziniert von dem, was er hörte und damit wird es in der ein oder anderen Weise in die Musik, die er zu der Zeit komponierte, eingeflossen sein. Das Quintett beginnt mit einer Solo-Melodie für das hinzugefügte Instrument, die zweite Bratsche, jedoch stellt ein anderes Thema das Hauptmaterial der Durchführung—eine Melodie, der ein indianisches Lied zugrunde liegt, das Dvořák in Spillville gehört hatte. Eine seltsam traurige Episode mit den beiden Bratschen erklingt vor der verkürzten Reprise. Das darauffolgende Scherzo ist ausgezeichnet gearbeitet und verwendet im Trio-Abschnitt ein Thema, das an dasjenige aus dem langsamen Satz der Symphonie „Aus der Neuen Welt“ erinnert. Ebenso ähnelt es dem Bratschenthema, das die Grundlage für die Variationen im Sextett liefert. Der dritte Satz, ein Larghetto-Thema mit fünf Variationen, tauscht die exotische Atmosphäre der indianischen Musik gegen schlichte Hingabe ein. Das Thema der Variationen steht zur einen Hälfte in Dur und zur anderen in Moll und ist geradezu genial gesetzt. Am Ende kehrt die Musik zu dem unverzierten Thema zurück. Während man in dem Variationensatz möglicherweise die Gegenwart Beethovens spürt, ähnelt das Hauptthema des Finales offensichtlich dem letzten Satz von Schuberts Trio in Es-Dur, D929, wie auch einem Thema Smetanas in dessen Trio in g-Moll. Obwohl es interessant ist, solche Parallelen zu Werken anderer Komponisten festzustellen, beeinträchtigen sie Dvořáks Leistungen in diesem Quintett keineswegs. Seine eigenen, individuellen Vorzüge können vollkommen jeglicher Kritik standhalten, die durch diese Verbindungen bei denjenigen hervorgerufen werden könnte, die das wahre Genie dieses genialen Mannes nicht schätzen können.